IGN has released fifteen minutes of Shadow of the Tomb Raider gameplay, the third game in the rebooted Tomb Raider series that takes Lara Croft to South America. While nothing much happens, it at least sets part of the scene for the game’s first part as Jonah and Lara track Trinity. Apparently, since Rise of the Tomb Raider, Lara has waged a private war against Trinity around the world, and has since tracked them to South America, which brings up the main plot of the game. Most of the gameplay is taken up by Lara and her boyfriend Jonah tracking a Trinity member known as Dominguez who is working with a Trinity cell in Cozumel, Mexico. From what we can see in the game it looks amazing, with great graphics and amazing lighting that make all of the environments and areas that we see from the gameplay, whether it’s a jungle cave, a shrine of Mayan stele, or a small town in Mexico celebrating the Day of the Dead. We don’t get any action from the Shadow of the Tomb Raider gameplay though aside from the game’s first minute or so, which shows Jonah and Lara being in a crashing plane, which gets ripped in half to separate both of them before crashing into the jungle. The scene then flashes back to two days earlier, so whatever events cause Jonah and Lara to get in that situation will undoubtedly be a roller coaster. 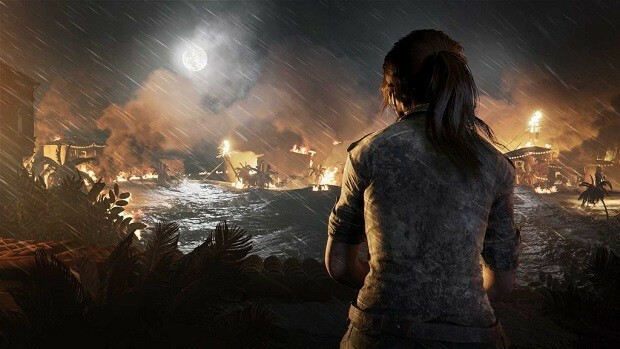 From what we’ve heard about Shadow of the Tomb Raider, we can expect it to be similar to previous Tomb Raider games, with various tombs that contain puzzles, a mix between stealth and open combat, and the use of Lara’s trusty bow and climbing hook, along with the supernatural becoming very much real. You can see the Shadow of the Tomb Raider gameplay by following this link to IGN’s website, and the game will be coming out on the Xbox One, Playstation 4, and PC on September 14.